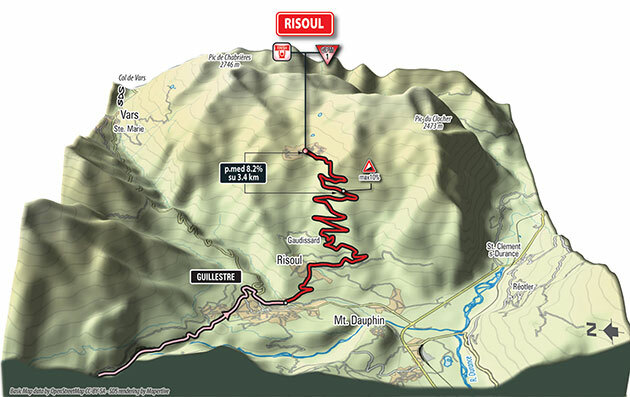 The Route: This is a high mountain stage featuring a summit finish, and “home” to the Cima Coppi. 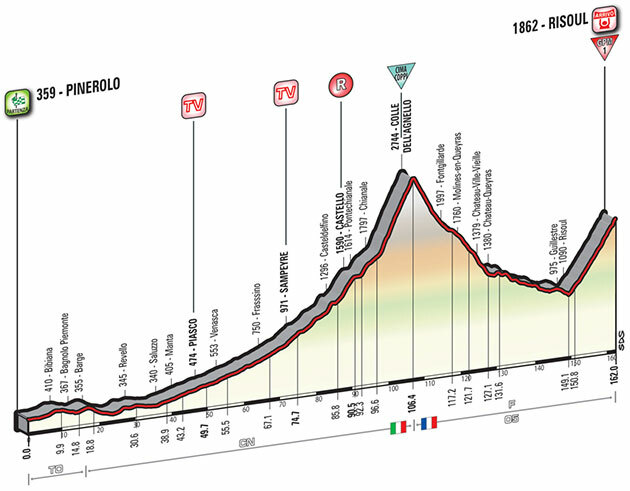 The route runs constantly uphill (on deceptively flat roads) over 80 km, all the way up to Casteldelfino. Here the road starts to climb up Colle dell’Agnello (Cima Coppi, 2744 m). The following 40 km run mostly downhill and lead to Guillestre, at the foot of the final climb. Beware of a few tunnels around km 135. The last 13 km run entirely uphill, with an average 7% gradient and 15 hairpins. The roadway is very wide and well surfaced. The home straight, 150 m in length, on 6-m wide asphalt road, has an 8% uphill gradient. 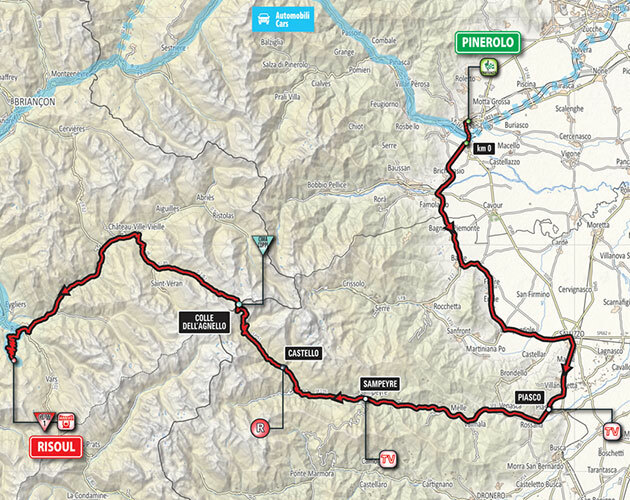 The winner of this stage, that includes the Cima Coppi, will receive the Trofeo Torriani. The Race: 160 riders started at 12:42 PM. 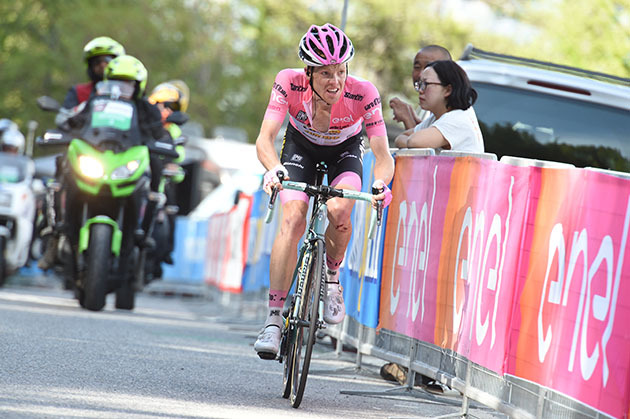 Stage 10 winner Giulio Ciccione, troubled with gastrointestinal problems, did not start. It also looks like Ilnur Zakarin, who was sitting in fifth place, crashed and quit the Giro at km 110. 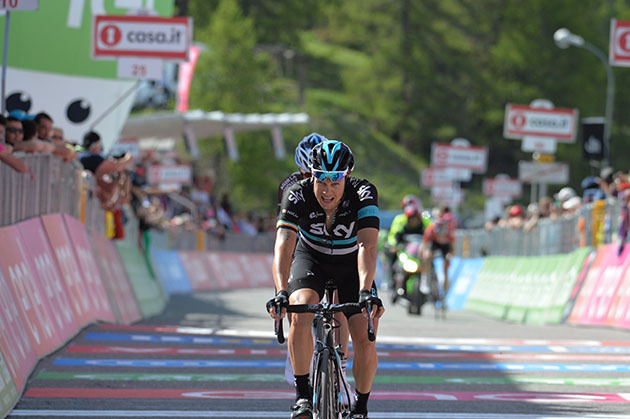 Race leader Steven Kruijswijk crashed on the descent of the Colle dell'Agnello, costing him the lead. Seconds after the stage finish, the stage winner said: “I’ve won by rage today. It hasn’t been easy to handle everything that has happened over the past few days. I dedicate this victory to Rosario [a young pupil of his who accidentally died two weeks ago]. I’m very happy. It’s been a terribly hard stage. I want to keep my feet on the ground. There’s another hard stage to contest tomorrow”. 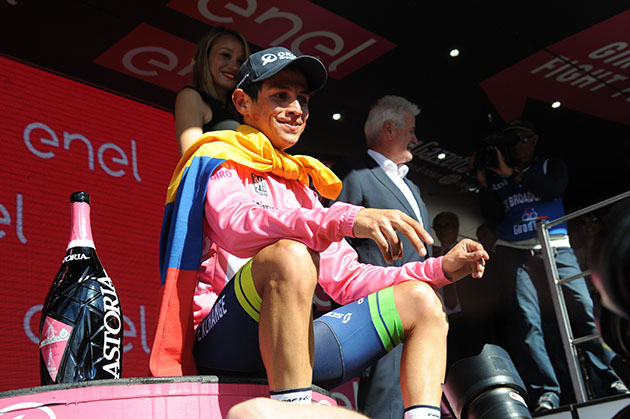 Colombian Esteban Chaves has moved into the lead of the 99th Giro d’Italia after finishing third on an epic stage 19 today in Italy. As Vincenzo Nibali (Astana Pro Team) took the stage victory ahead, Chaves finished over four minutes ahead of leader Steven Kruijswijk (LottoNL-Jumbo) who crashed into a wall of snow on the descent of the ‘Cima Coppi’. 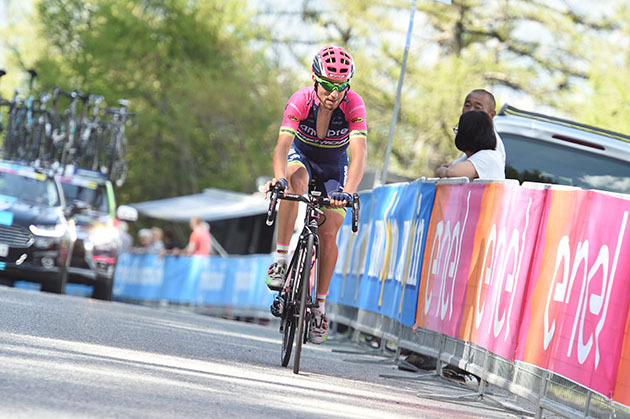 The 26-year-old claimed the pink jersey for ORICA-GreenEDGE and holds a 44second advantage to Nibali with just two more race days to come. A great team performance saw Ruben Plaza escape in the breakaway on the ‘Cima Coppi’ climb before joining up with Chaves later in the stage and supporting the queen stage winner onto the start of the final climb. How it happened: Today’s stage 19 began at a frantically fast pace with riders being dropped from the peloton almost as soon as the flag dropped. Despite countless attempts the peloton was desperately keeping things together as the start of the first climb, the Colle dell’Agnello, approached. Plaza was one of 28 riders who finally formed the breakaway that escaped on the climb and developed an advantage of four minutes on the Chaves group. 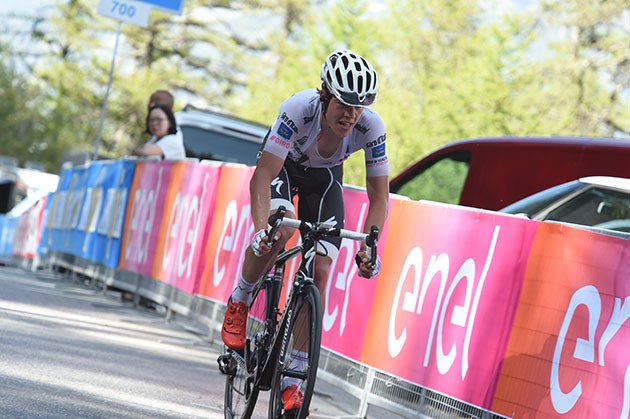 Six riders including Diego Ulissi (Lampre-Merida) and Tim Wellens (Lotto-Soudal) attacked from the breakaway group ahead of the first mountains points of the day with Ulissi claiming the points. The six riders had around 30seconds on the twenty chasers before Michele Scarponi (Astana) began to drive the pace and broke clear with 65kilometres left to race. The Chaves and Kruijswijk group were six minutes behind as Scarponi neared the cloud covered summit of the Colle dell’Agnello and Chaves decided to make his move. Chaves attacked after a huge pull by Howson with initially only Kruijswijk able to follow. Nibali caught back on with the Astana rider, Kruijswijk and Chaves now putting over 30seconds into the Valverde group. 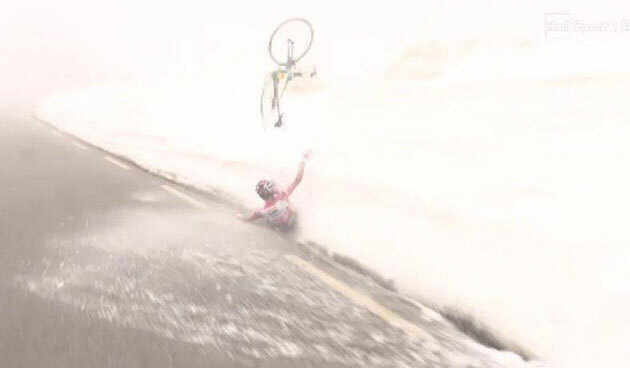 Race leader Kruijswijk crashed dramatically into the snow banked on the roadside a few hundred metres into the descent with the Dutchman losing contact with Chaves and Nibali who had then joined up with Plaza. Into the last 40kilometres and the tactics of ORICA-GreenEDGE were proving to be spot on as Plaza powered forward with Chaves on his wheel and Nibali just behind. 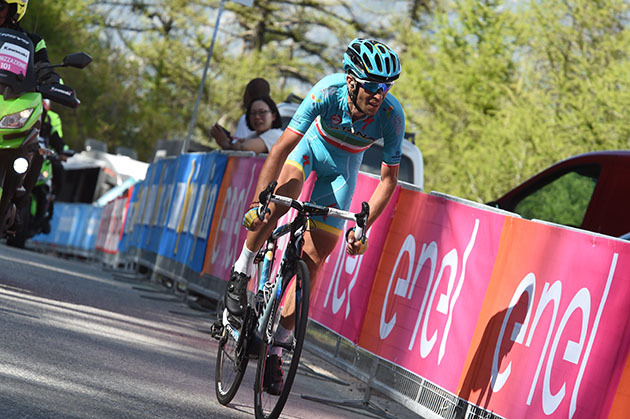 Ahead, Scarponi was virtually track standing in the middle of the road with 30kilometres to go as he waited for Nibali ahead of the final climb. 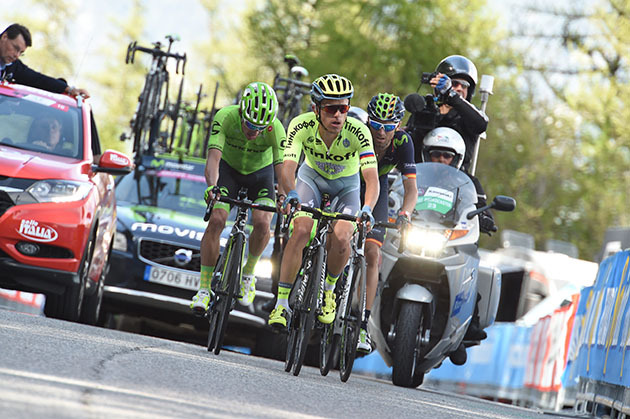 The Chaves group had swelled to seven riders as they picked up Scarponi and stragglers from the earlier breakaway. Plaza led the group onto the final climb to Risoul with 12kilometres to go and Kruijswijk was now over two minutes behind and losing time. Nibali attacked multiple times only to be covered by Chaves, until he eventually gained 20metres on Chaves who maintained his rhythm as the gradient sharpened. Nibali pushed out for the stage win with Chaves crossing the line in third place, 53seconds later, to take the race lead and the pink jersey into tomorrow’s penultimate stage. Stage 20 is another difficult Alpine mountain stage covering 134kilometres and three peaks from Gillestre to Sant’Anna di Vinadio. The course includes three epic climbs, the Col de Vars, the Col de la Bonette and the Colle della Lombarda all coming before a tough summit finish. 7 URAN URAN Rigoberto CANNONDALE s.t. 10 DUPONT Hubert AG2R-LA MONDIALE s.t. 23 DENIFL Stefan IAM CYCLING s.t. 26 SILIN Egor KATUSHA s.t. 30 FOLIFOROV Alexander GAZPROM-RUSVELO s.t. 31 MONTAGUTI Matteo AG2R-LA MONDIALE s.t. 32 CONTI Valerio LAMPRE-MERIDA s.t. 42 SUTHERLAND Rory MOVISTAR s.t. 44 VERONA Carlos ETIXX-QUICK STEP s.t. 45 KUDUS GHEBREMEDHIN Merhawi DIMENSION DATA s.t. 46 HOWSON Damien ORICA-GREENEDGE s.t. 49 ANTON HERNANDEZ Igor DIMENSION DATA s.t. 51 MORI Manuele LAMPRE-MERIDA s.t. 52 HANSEN Adam LOTTO-SOUDAL s.t. 53 CAPECCHI Eros ASTANA s.t. 54 KOCHETKOV Pavel KATUSHA s.t. 55 ROVNY Ivan TINKOFF s.t. 56 MALACARNE Davide ASTANA s.t. 58 DOMBROWSKI Joseph Lloyd CANNONDALE s.t. 59 BATTAGLIN Enrico LOTTO NL-JUMBO s.t. 60 KANGERT Tanel ASTANA s.t. 62 FORMOLO Davide CANNONDALE s.t. 63 ZOIDL Riccardo TREK-SEGAFREDO s.t. 65 LOPEZ GARCIA David SKY s.t. 66 VAN ZYL Johann DIMENSION DATA s.t. 67 TANKINK Bram LOTTO NL-JUMBO s.t. 71 HAGA Chad GIANT-ALPECIN s.t. 75 DOMONT Axel AG2R-LA MONDIALE s.t. 78 PETILLI Simone LAMPRE-MERIDA s.t. 80 SUTTERLIN Jasha MOVISTAR s.t. 81 FIRSANOV Sergey GAZPROM-RUSVELO s.t. 82 VOROBYEV Anton KATUSHA s.t. 83 SERRY Pieter ETIXX-QUICK STEP s.t. 84 MARTINEZ Daniel WILIER TRIESTINA s.t. 85 KEIZER Martijn LOTTO NL-JUMBO s.t. 94 PETROV Evgeny TINKOFF s.t. 97 POZZATO Filippo WILIER TRIESTINA s.t. 98 QUINZIATO Manuel BMC s.t. 99 ZABEL Rick BMC s.t. 100 DELAGE Mickael FDJ s.t. 101 COLEDAN Marco TREK-SEGAFREDO s.t. 102 SIMION Paolo BARDIANI-CSF s.t. 104 SENNI Manuel BMC s.t. 105 KADRI Blel AG2R-LA MONDIALE s.t. 107 RODRIGUEZ Cristian WILIER TRIESTINA s.t. 108 WISNIOWSKI Lukasz ETIXX-QUICK STEP s.t. 109 LE GAC Olivier FDJ s.t. 110 MOHORIC Matej LAMPRE-MERIDA s.t. 111 BONGIORNO Francesco BARDIANI-CSF s.t. 112 TUFT Svein ORICA-GREENEDGE s.t. 113 BOLE Grega NIPPO-VINI FANTINI s.t. 114 MAESTRI Mirco BARDIANI-CSF s.t. 115 ALAFACI Eugenio TREK-SEGAFREDO s.t. 116 CASTELIJNS Twan LOTTO NL-JUMBO s.t. 117 JI Cheng GIANT-ALPECIN s.t. 118 COLBRELLI Sonny BARDIANI-CSF s.t. 119 FISCHER Murilo Antonio FDJ s.t. 120 STAMSNIJDER Tom GIANT-ALPECIN s.t. 121 WELLENS Tim LOTTO-SOUDAL s.t. 122 KOSHEVOY Ilia LAMPRE-MERIDA s.t. 123 JIM Songezo DIMENSION DATA s.t. 124 DE BIE Sean LOTTO-SOUDAL s.t. 125 VAN EMDEN Jos LOTTO NL-JUMBO s.t. 126 BEWLEY Sam ORICA-GREENEDGE s.t. 127 SOLOMENNIKOV Andrey GAZPROM-RUSVELO s.t. 128 HEPBURN Michael ORICA-GREENEDGE s.t. 129 KONOVALOVAS Ignatas FDJ s.t. 131 BOBRIDGE Jack TREK-SEGAFREDO s.t. 132 VENTER Jacobus DIMENSION DATA s.t. 133 TOSATTO Matteo TINKOFF s.t. 136 YAMAMOTO Genki NIPPO-VINI FANTINI s.t. 138 VANENDERT Jelle LOTTO-SOUDAL s.t. 139 LIGTHART Pim LOTTO-SOUDAL s.t. 140 NIZZOLO Giacomo TREK-SEGAFREDO s.t. 141 ROSSKOPF Joseph BMC s.t. 142 COURTEILLE Arnaud FDJ s.t. 143 AMEZQUETA Julen WILIER TRIESTINA s.t. 144 SAVITSKIY Ivan GAZPROM-RUSVELO s.t. 146 PORSEV Alexander KATUSHA s.t. 147 TRENTIN Matteo ETIXX-QUICK STEP s.t. 148 BOEM Nicola BARDIANI-CSF s.t. 149 OSS Daniel BMC s.t. 150 BUSATO Matteo WILIER TRIESTINA s.t. 152 DE MARCHI Alessandro BMC s.t. 154 ARNDT Nikias GIANT-ALPECIN s.t. 155 KLUGE Roger IAM CYCLING s.t. 156 FERRARI Roberto LAMPRE-MERIDA s.t. Steven Kruijswijk makes it to the finish, worse for the wear after crashing. 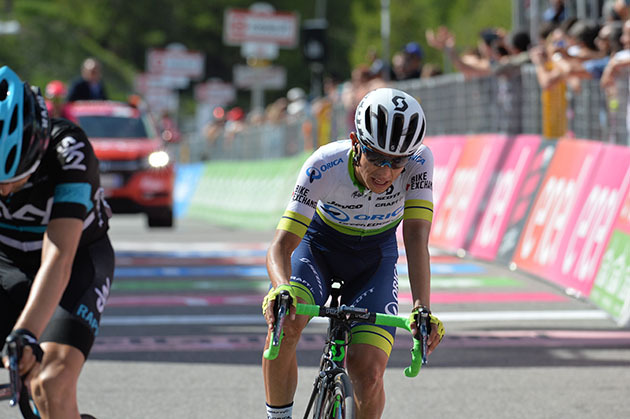 Esteban Chaves finishes third, good enough to make him the new race leader. Young rider classification leader Bob Jungels nears the finish. Rafal Majka on the climb. 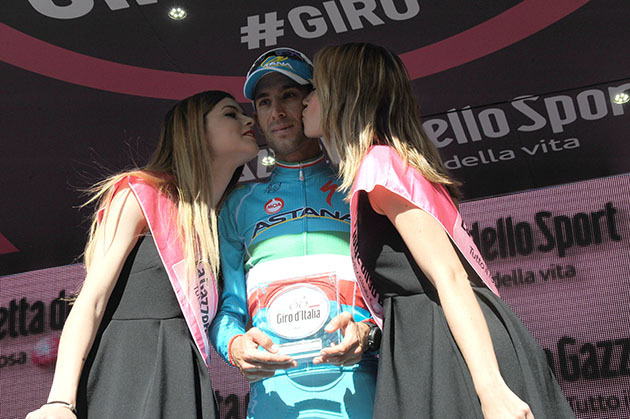 Italy should be calming down a bit now that Nibali has shown he does have great form after a couple of rough days.